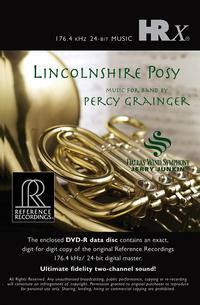 Lincolnshire Posy showcases the band music of Percy Grainger, including favorites "Lincolnshire Posy" and "Irish Tune From Country Derry ("Danny Boy")". Australia considers Grainger its greatest composer; the U.S., where he lived for most of his life, praises him as a music educator, composer and arranger of band music; and England considers him supremely important in the preservation and arrangement of British folk songs. Grainger's gems are performed to perfection by America's only full-time professional wind band, conducted by Jerry Junkin. Grainger specified many unusual, optional, instruments, and this recording has them all. Hear these "original instrument" performances in the spectacular sonics captured by Reference Recordings' world-renowned team of engineer Keith Johnson and producer Tam Henderson.